Soraya is a regular contributor to The Artist magazine. Her articles vary from reviewing products to a four-part series about colour, figure painting, use of acrylics, mixed media, and many more subjects. To check details of the publications the articles appear in please contact The Artist magazine on 01580 763673. You can browse The Artist magazine online here. Soraya also writes for the off-shoot magazine StartArt also published by The Artist and Leisure Painter. StartArt is suitable for beginners. The articles have comprehensive text plus brilliantly clear step-by-step illustrations. The versatility of acrylics has made it one of the most popular media among amateur artists. 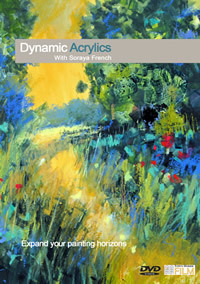 Here Soraya explores the medium in detail, encouraging readers to work with acrylics creatively and to experiment with different techniques to achieve exciting and dramatic effects. Exploring the medium of acrylics in detail, Soraya explains the various types of acrylics – paints and inks – and the different ways they can be used, covering the techniques for both watercolour and opaque style. With the use of practical exercises, studio tips and step-by-step demonstrations, Soraya focuses on a broad range of subjects, from flowers and still life, to animals, birds and landscapes. She also introduces the works of several other professional artists to provide a broader view of different styles of acrylic painting. 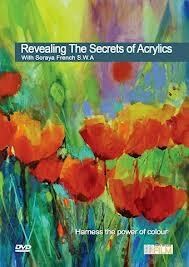 International Artist and Author, Soraya demonstrates for GOLDEN Artist Colours, runs private art workshops, and regularly teaches her painting techniques to art groups in the UK. She writes regularly for The Artist magazine. 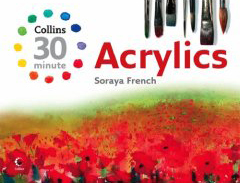 Soraya is the author of 30-minute Acrylics and Dynamic Acrylics published by Harper Collins. She is a member of the Society of Women Artists and of The Floral Painters Society and President of the Andover Society. A useful well written colourful work that should tempt any serious art student [or any painter] to be bolder in their use of acrylics. Acrylics are a sixty year-old medium currently undergoing a renaissance with many exciting formulations an new colours. I would recommend that this book should be in every serious artist library. This is an excellent book by an inspiring artist. Her use of colour will kick start anyone bogged down in dull landscape tones.Soraya is a cracking painter and great communicator. Her DVD of the same name goes nicely with this book. 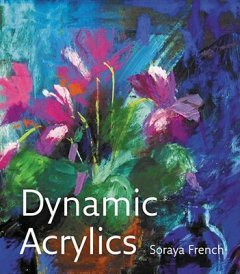 Soraya French is one of the most in demand teachers and demonstrators in the acrylic medium in the UK, thanks to her vibrant, dynamic and exciting work. In this DVD she demonstrates the use of a range of acrylic paints from acrylic inks to heavy body acrylics. She paints five full demonstrations showing how the various types of acrylic paints can be used to best effect and also includes the use of texture mediums for extra effects. This DVD really shows off the versatility that acrylic paints can offer. If you’re looking for a DVD on how to paint intricate photo-realistic ../../content/images then stop reading now and look for something else. 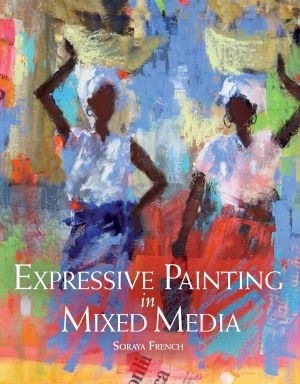 However if you are already aware of Soraya’s work and want to know more about using acrylic paints and inks to produce vibrant expressionistic paintings then look no futher as this DVD is an absolute treat. I was a little bit put off by the price at first as money is tight but I am so glad I splashed out – I can’t get to any of her workshops so this is the next best thing. At almost two hours long she squeezes in five full demonstrations using different types of acrylics and mediums as well as giving hints and tips along the way. I found the DVD to be an inspiration – see if you can catch some clips on the Town House web site – it made me want to pick up my paint brushes and get started – I can’t wait for her new book so I can pour though the luscious pictures! I can thoroughly recommend the DVD. Many people think they don’t have enough time to paint, but in this attractive guide Soraya encourages quick and simple learning. By working with just a few materials and focusing on just the key techniques it is possible to achieve successful paintings in no more than half an hour. And for those artists who already have a little painting experience, learning to work more quickly enables them to free up their style and paint more spontaneously. With clear, easy-to-follow advice and ideas presented in a simple approachable way, this book provides a perfect introduction to painting acrylics quickly and easily.